Russian touring teams were highly popular in the mid-sixties and they made a great impression on their visit to Old Meadowbank on 10th July 1965. The Russians had a practise session in bright sunshine on a dusty track in the morning - it was supposed to be private but the fans swarmed over the fence to watch the mystery men from the east. Sadly about 4pm heavy rain started, affecting the evening's action - but a fine crowd still turned out to watch the match. On a very wet track the Russians won 57-51 with the great Igor Plechanov socoring 14. 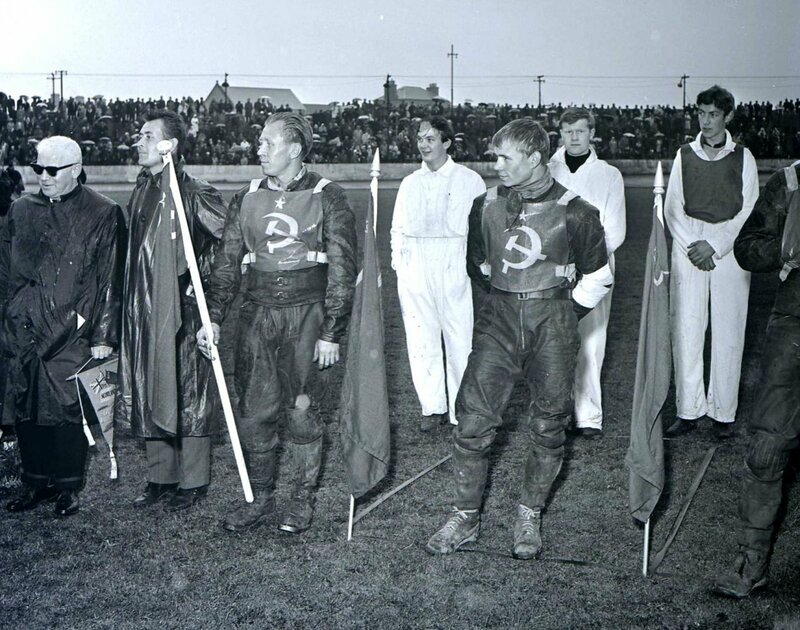 Plechanov is seen here on parade with his team mate Yuri Chekranov, and we THINK that the track staff member second from the right is future SCB Manager and referee Ronnie Allan.